The SC permits the physician's interference with patient's mind control. This can be achieved by various ways. These ways are termed as “methodology” of SC. By following these methodologies, SC not only negates the negative thoughts but also endeavors to replace them with positivity. Each methodology has the focus on the basic functions of SC [Table 1]. SC has two main principles. Almost all techniques derived from SC have its base in these following two principles. Both these principles undertake to diffuse the emotional imbalance by changing the attitude toward the whole situation. Inducement of emotions opposite to those associated with patient's distress - Substitution or replacement of emotions with opposite ones is another novel method induced by SC. It is advised that if the patient has developed psychosis due to emotional disorders such as excessive Kama (lust or affection or desire), Bhaya (fear), Krodha (anger or aversion), Harsha (happiness), Irshya (jealousy), and Lobha (greed), he/she should be treated by inducing the opposite nature of the respective attained emotions. For example, “Kama” (affection) toward alcohol may be alleviated by inducing “Krodha” (aversion) toward that affection and vice versa. Dimensions here refer to “direction.” There are three dimensions explained in the Ayurveda context for SC. The following three dimensions are the areas which are to be considered in a patient before commencing any technique of SC. Atmadinam Vijnanam – To obtain all round basic knowledge of Atma (self), Desa (region), Kula (family), Kala (season), Bala (physic and psychic strength), and Shakti (capacity) of an individual. There are three psychotherapeutic domains mentioned as an applied feature of SC. These domains [Table 2] have three different mode of approach. The therapeutic utility of the techniques of SC [Table 3], has its base from these psychotherapeutic domains of SC. Atma vijnana chikitsa or stimulating the consciousness or to set self-realization-This domain brings mental tranquillity through understanding the hidden conflicts which are the source of the emotional illness. 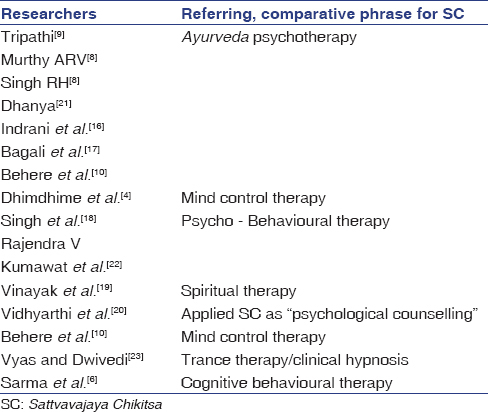 By adopting above-mentioned psychotherapeutic domains, five techniques [Table 3] of SC are witnessed in Ayurveda for any mental disorder. Each of these techniques, their characteristic features has an empirical approach. Each of them provides goal and achievement to be accomplished and based on these, a treatment plan can be set [Table 4]. JS Tripathi resembles the body-like a chariot. The five senses are like horses, the mind is like the reins and only by holding the reins firmly, one can keep control on the senses. If we do not control these five senses, mind will drag us away. SC directs the traditions to control this reins and thus enables us to have control over unwholesome objects/thoughts/perceptions. Indrani et al. conclude SC acts by promoting Jnana (Knowledge) and Vijnana (knowledge of scriptural and texts) in the affected individuals. SC in one hand diminishes the impaired Rajas and Tamas of a pathological mind and in other hand increases the Sattva (balanced consciousness), Dhairya (fortitude), Smriti (consider the real, genuine nature of an object or subject), and Samadhi (a state of complete cessation of all types of Dukha/Vikara-misery). These are considered as the goals achieved by SC. Dhimdhime et al. believe SC is physio-pharmacological method/therapy and is designed to effect mind control. The various techniques in designing this method/therapy include Manonigraha (mind control methods), Ashwasanadhyaha (reconciliatory methods), Pratidvandvabhava (replacement of emotions), Manokshobhanam (psychophysical shock), and Sadacharah (moral behavioral code). If these designed techniques of SC is followed with Abhyasa (constant practice), Vairagya (active renunciation), Sadhusangati (associated with pious), Pranayama (regulation of elan vital), and Adhyatmavidya (abstract meditation) complete control over mind can be attained. Bagali et al. stated that Ayurveda and its SC provide better treatment modality in controlling/managing the growing stress and strain of mental life when compared with other than existing sciences. SC prevents the impairment of Dhee (intellect), Dhriti (determination/patience), and Smriti (memory). It also brings them back into the normal state if impaired. Satyapal Singh relates SC as psycho– behavioral therapy and it is mainly applied for mental or emotional stress and disturbances. Vinayak et al. conclude SC acts as spiritual therapy which helps in controlling mind with Vichara (right thinking). Thus, a sound and positive mental health is achieved by SC. ARV Murthy and RH Singh, the pioneers of Ayurveda think SC as a combo therapy of assurance, replacement of opposite emotions, and psycho shock therapy. SC helps in restraining the mind from its harmful objects/thoughts/perception of impaired intellect, patience, and memory. They give a variety of applied aspect of SC in the areas of assurance, replacing the emotions, regulation of thought process, reframing the ideas, channeling the presumptions, correction of objectiveness/ideas, proper guidance, and advice for taking right decision with proper control of patience. Vidhyarthi et al. give a wide range of application of SC. They used SC concepts as psychological counseling in the form of cognitive behavioral therapy and assured a positive result in few clinical conditions [Table 5]. Dhanya opines that mind can be restrained only after adopting Dhairya (assurance/support). Satya Buddhi (true knowledge of self and ambience) is essential in attaining Jnana. Shastra Jnana (scriptural knowledge) is indeed needed to attain Vijnana. Tattva Jnana (true understanding) is essential for the attainment of Smriti. SC helps to attend all these. She also concludes that SC overcomes Rajas and Tamas by its proper implication; Samadhi (mental equanimity) is attained at the end. Behere et al., on reviewing the contribution of Ayurveda concepts to psychotherapy, clearly says SC is a mind control therapy which is achieved through spiritual knowledge, philosophies, fortitude, remembrance, and concentration. Ayurveda psychotherapy plays a dual role a) as a revival of the authentic medical culture-the exercise of practice with an assumed primordial dimension b) as a discovery of authentic subjectivity-the revelation of a self with an assumed interior depth. Their review also opines that “integration” is essential between the contemporary psychotherapy and the concepts, principles of ancient science like Ayurveda. If integrated, it becomes a powerful therapeutic combination because their observation indicates that the worldwide western therapeutic intervention is almost melted with the Ayurvedic holistic principles. They also raise a potential scope of revival and development of the suitable psychotherapeutic models from the concepts of SC. They agree SC corrects Prajnaparadha (intellectual blasphemy) which is one of the prime causer for the establishment and development of mental disease. They correlated refraining ideas of SC with “Erickson's hypnosis” and the principle of inducing emotions of opposite theory with “Gestalt therapy”. They tried to understand the role of therapist of SC and concluded that the ideal therapist of SC attempts to know the state of emotions of a patient which are casually associated with his illnesses. Thus, the therapist develops the strategies to replace the negative emotions with opposite positive one. Almost all researchers opine that SC and modern psychotherapy need not be compared as both of them have different and vast descriptions. They retained the term “Ayurveda psychotherapy” whenever they tried to compare both. However, few of them compared SC with modern theories of psychotherapy based on the applicability of similar goal of withdrawing subjects from unwholesome objects/thoughts/perception. All of them have tried to term SC with a new name without diluting the concepts and descriptions of SC [Table 6]. By reconsidering the above concepts, researches, and reviews, a probable mode of action of SC can be drawn [Figure 1]. With the base of methodology, dimensions and psychotherapeutic domains of SC a suitable technique is planned and applied. As said earlier each technique of SC has its own mode of approach. Thus with the help of these derived techniques, SC as a whole may target on the inhibition of the functions of the impaired mental attributes (Rajas and Tamas) and also corrects the imbalanced emotions of Dhee, Dhriti, Smriti, and Prajnaparadha. While at the same time on the other hand, it rectifies the disturbed Sattva guna (balancing property of mind) and motivates it through Dhairya and Samadhi. The whole progression of this “balancing course of action of SC” includes assurance/replacement of emotions/regulation of thought process/re-framing of ideas/channeling of presumptions/correction of objectives and ideals/proper guidance and advice for taking right decisions/proper control of patience. Finally, this process results in controlling of Manas from Ahita Artha which is a final goal of SC. Thus, this treatment modality of SC can be considered as the probable “nonpharmacological nootropic effect”. The search for the studies on the nootropic effect of SC in few databases resulted with a good number of research works [Table 7]. It was observed that SC was been conducted as single psychotherapy, as a single psychotherapy and also as an adjuvant to drug therapy (as a combination). The combination of drug therapy with SC was proved to be having a better efficacy than a monotherapy. SC (Ayurveda psychotherapy) is a nonpharmacological method/therapy opted to repair the impaired vulnerable mind and also to maintain its harmonious state. SC has a wide range of contribution towards clinical applicability in mental disorders if used judicially. SC has a potential to redefine the art and science of ancient psychotherapy and provide a new dimension in treating psychiatric, psychological, and psychosomatic disorders. SC triggers the consciousness and acts at the level of judgment and discriminates the negative/maladaptive thoughts, brings firmness, strength, stability, and finally restrains the mind. An Ayurvedic physician or a psychiatrist should follow the psychotherapeutic treatment strategies and techniques offered by concepts of SC. The paper thus concludes with an attempt to rediscover the critical knowledge about the principles of SC and its applied aspects contributed by various scholars in the field of Ayurveda and modern science. The researches, reviews, and the clinical studies on SC having the “nonpharmacological nootropic effect,” being an effective adjuvant treatment modality are the take-home note from the present manuscript. The constant support of Dr. Prasanna N. Rao, Professor and Principal; Dr. Suhas Kumar Shetty, Professor and Head; Dr. Manjunatha Adiga, Associate professor and PG scholars from the Dept of Manovigyan Avum Manasaroga (Ayurveda Psychology and Psychiatry) of SDM College of Ayurveda, Hassan are accredited. Authors are highly grateful to those inspirational lectures of Dr. V Rajendra, Professor and Head of the Department of Kayachikitsa, Govt. Ayurveda Medical College, Mysore which motivated us in to take up the work. Khanna HR. ‘Pratipaksha bhavana (Contrary meditation) given to us by great yoga master Patanjali’. J Human Values 2000;6:85-8. Madhushree RN, Suhas KS, Savitha HP, Narayan Prakash B. Research article; Role of Panchagavya Gritha in the management of Atattvabhinivesha (Obsessive Compulsive Disorder). Int Ayurvedic Med J 2015;3:263746. Apte VS. The Student's Sanskrit-English Dictionary. 2nd ed. Delhi: Motilal Banarasidas Publication; 1970. p. 207. Dhimdhime RS, Pawar KB, Kodape DT, Dhimdhime SR, Baghel P. Review article; ‘Concept of inter relationship between Manas and Sharira w.s.r to Ayurveda treatment. Int J Ayurveda Pharm Res 2017;5:703. Acharya Jadavji Trikamji, editor. Ayurveda Deepika Commentary of Chakrapanidatta on Charaka Samhita, Sutra Sthana 11/54, Reprint Edition. Varanasi: Chowkamba Publications; 1987. Sarma DR, Ali K, Sarmah J. Review article; an ayurvedic perspective to cognitive behaviour therapy vis a vis Satwavajaya Chikitsa. Int J Ayurveda Pharm Res 2016;4:425. Avasthi A, Anthony R. Psychotherapy in Indian context. J Clin Psychiatry 1998;3:26-8. Murthy ARV, Singh RH. The concept of psychiatry in Ayurveda with special reference to Sattvavajaya Chikitsa: Ancient Science of Life 1987;6:255-61. Tripathi JS. Review article on Ayurvedic psychotherapy. Ann Ayurvedic Med 2012;1:31-8. Behere PB, Das A, Yadav R, Behere AP. Ayurvedic concepts related to psychotherapy. Indian J Psychiatry 2013;55:S310-4. Dhoriyani DD. Dissertation work on Applied Concept of Sattva, Sattvabala and its Promotion through Sattvavajaya and Yuktivyapashraya. Department of Basic Principles, IPGTRA, Gujarat Ayurveda University; April, 2014. Acharya Jadavji Trikamji, editor. Ayurveda Deepika Commentary of Chakrapanidatta on Charaka Samhita, Sutra Sthana11/46, Reprint Edition. Varanasi: Chowkamba Publications; 1987. Apte VS. The Student's Sanskrit-English Dictionary. 2nd ed. Delhi: Motilal Banarasidas Publication; 1970. p. 272. Apte VS. The Student's Sanskrit-English Dictionary. 2nd ed. Delhi: Motilal Banarasidas Publication; 1970. p. 509. Acharya Jadavji Trikamji, editor. Ayurveda Deepika Commentary of Chakrapanidatta on Charaka Samhita, C. Su. 1/58, Reprint Edition. Varanasi: Chowkamba Publications; 1987. Indrani, Satpal, Gour MB, Pandey YK, Sabharwal P. Review article; A critical appraisal of Sattva and significance in the management of disease. World J Pharm Res 2018;13:37585. Bagali SS, Umapathi CB, Deshmukh RA. 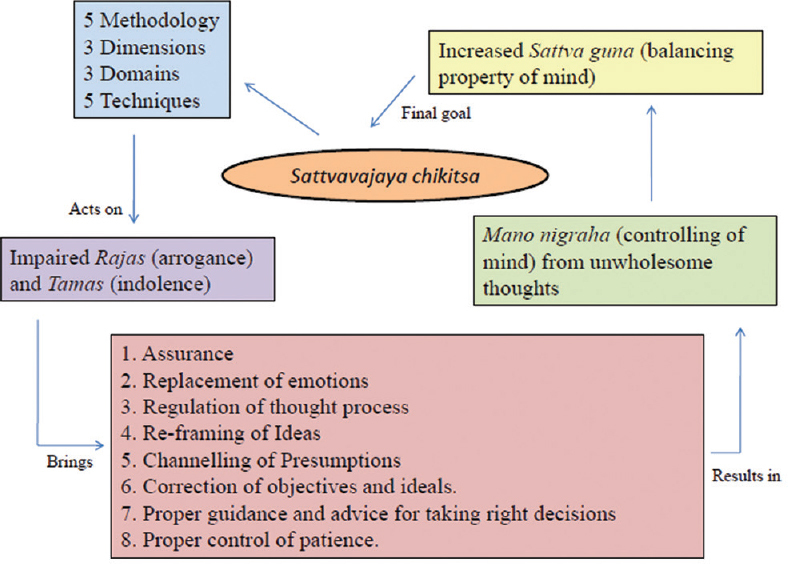 Concept of Sattvavajaya Chikitsa (psychotherapy). J Ayurveda Integrated Med Sci 2016;1:5663. Singh S, Tripathi JS, Rai NP. An appraisal of the bioavailability enhancers in Ayurveda in the light of recent pharmacological advances. Ayu 2016;37:3-10. Vinayak PR, Kathane V, Pathrikar V. Prevention of suicidal attempts in present era through Ayurveda. Ayurlog Natl J Res Ayurvedic Sci 2018;6:111. Vidhyarthi AK, Vijay RP. Review article; Role of Manochikitsa (Psychological counselling) in the management of modern days Manovikara. J Innovations Pharm Biol Sci 2016;3:203. Dhanya T. Review article on Treatment of Manovikara in Ayurveda. Int J Innovative Res Med Sci 2017;2:1268-71. Kumawat NK, Dhananjay, Dharmendra KS. 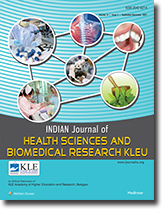 Review article; Therapeutic and preventive approach on swine flu in Ayurveda – A critical review. Ayushdhara 2015;2:115. Vyas KM, Dwivedi RR. Role of Sattvavajaya Chikitsa (Trance therapy) in the management of Manasa-Dosha Ajeerna. Ayu 2012;33:78-84. Kolhe G, Mandal S, Godatwar P. Research article; Therapeutic evaluation of Yastimadhu Ghana vati and Tagara Ghana vati along with psychotherapy in the management of mental adjustment disorder of young adults. J Ayurveda Holistic Med 2013;1:814. Dileep K, Tripati JS, Sanjay G, Murthy KHVVSSS Narasimha. Research article; A comparative clinical evaluation of Sarpagandhachurna yoga and Sattvavajaya Chikitsa (Ayurvedic psychotherapy) in the management of Yoshaapasmara visavis hysterical neurosis. J Sci Res Pharm 2012;1:236. Amin H, Sharma R. Nootropic efficacy of Satvavajaya chikitsa and Ayurvedic drug therapy: A comparative clinical exposition. Int J Yoga 2015;8:109-16. Shrilata, Suhas KS, Savitha HP. Research article; Ayurvedic management of premenstrual syndrome-A case study. Int J Res Ayurveda Pharmacol 2017;8 Suppl 2:11921.